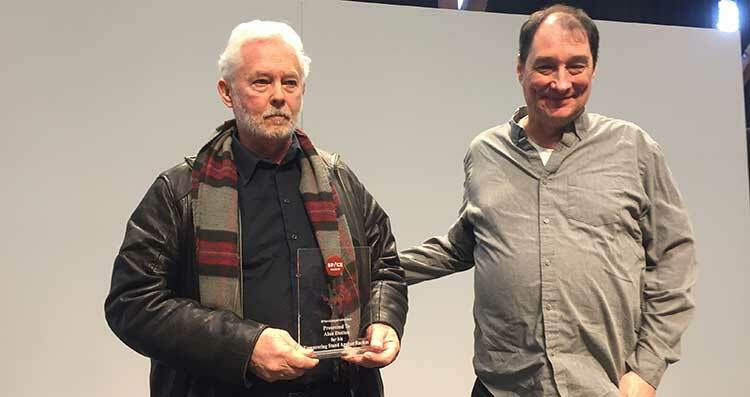 The Georgia Straight Editor Charlie Smith and anti-racism educationist and activist Alan Dutton were honoured for standing up against white supremacy at the fourth annual Raise Your Hands Against Racism (RYHAR) campaign event held in Vancouver on Saturday afternoon. Launched by Spice Radio 1200 AM in 2015, the RYHAR encourages people to celebrate Holi – a Hindu festival of colours – and make a statement against racism. As part of this campaign, Spice Radio CEO Shushma Datt and her team honour individuals who stand up against hate every year. This year, Smith and Dutton were picked for challenging white supremacy. While Smith has been consistently writing against racism, Dutton has been on the frontlines of many anti-racism campaigns for which he has been receiving death threats from the white nationalists. Smith too had faced a racist backlash for advocating for the rights of visible minorities through his editorials. University of British Columbia professor Dr. Sunera Thobani presented the first award to Smith. Dr. Thobani was honoured by Spice Radio last year for challenging Islamophobia. She had received many hate messages for questioning the racist policies of the US that led to the 9/11 attacks. Datt had presented the very first annual award to senior Royal Canadian Mounted Police (RCMP) officer Baltej Singh Dhillon in 2016. Dhillon, who was the first turbaned Sikh officer to be recruited by the RCMP, had faced a hostile campaign both inside and outside the force. BC Premier John Horgan also became part of this initiative by posting his picture with hand raised against racism on social media. A message from his office was read out by Surrey-Green Timbers MLA Rachna Singh at the event held at Roundhouse Community Centre. Singh has been instrumental in organizing anti-racism events in Surrey and is very vocal on these issues. Minister Bruce Ralston was also in attendance. The event that invited people who dipped their hands in colour and left their hand prints on a white paper along with statements against racism was opened by Cecilia Point, Indigenous activist from Musqueam Band, with a traditional song to recognize that Canada was built as a nation state on the lands belonging to the First Nations. Another indigenous activist associated with BC Federation of Labour, Joyce Galuska, also addressed the gathering. Galuska had started a letter writing campaign asking the Canadian government to launch a national inquiry into the missing and murdered indigenous women. Dr. Arun Garg, an authority on Hindu religion, told the gathering about the significance of Holi, which encourages people to bury their prejudices and differences and come together and throw colours at each other to become one. Spice Radio News Director Safeeya Pirani introduced the gathering to budding newscaster Sohila Sethi, who is being groomed by Pirani as part of her initiative to train child news reporters. Raya Arya, a young animal rights activist, also spoke on the occasion and encouraged people to give up meat eating and respect other species on earth as well. Team Shiamak and South Asian Arts Society also performed at the event. Another RYHAR event was simultaneously held at Surrey North Recreational Center that also received a huge response. Minister Jinny Sims was among those who showed up in Surrey.